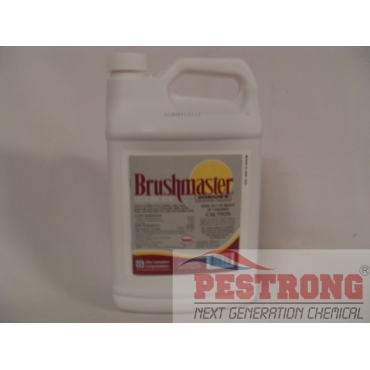 Where to Buy Brushmaster Herbicide, Brushmaster Herbicide - Gal - $76.95 for Sale with Fast Free Shipping! Brushmaster Herbicide - Gal combines superior brush control with flexability in application methods and schedules. BrushMaster can be applied almost any time of the year. Whether applied foliar, basal bark, cut stump or frill, BrushMaster provides efficient and dependable brush and broadleaf weed control in fencelines, roadside ditches, road shoulders, in firebreaks and around farmstead buildings. Most cool-season grasses are tolerant to applications of BrushMaster when mixed with water for foliar treatments, so BrushMaster will not strip treated areas of erosion protection like mechanical methods and chemical sterilants. Yet BrushMaster is tough on brush and broadleaf weeds. BrushMaster is a low volatile ester formulation containing a Trimec herbicide complex for synergistic activity among active ingredients and maximum penetration into plant tissue for root kill. And BrushMaster breaks down rapidly in the soil making it a sound choice for brush control that is not only efficient, but cost effective as well. Versatile Brushmaster Brush and weed control Herbicide combines superior brush control with flexability in application methods and schedules. It provides an effective, economical solution to your toughest brush problems - any time of the year! RATE: 1.25 ~ 5 oz per 1 gallon of water or 1 ~ 4 gal. per 100 gallons of water. I have not had any issues like that, unless over applied.